Mix a standard application of a balanced organic fertiliser into the soil prior to planting along with a generous helping of well-rotted compost. When growing begonias in containers, use a rich compost that holds moisture well. Coleus and Impatiens. Begonias are go-anywhere annuals often used to bring colour to isolated spots. They are among the easiest summer annuals to grow in containers. Tiny begonia seeds can be sown indoors in late winter, but it takes three months to grow a seedling to transplanting size. 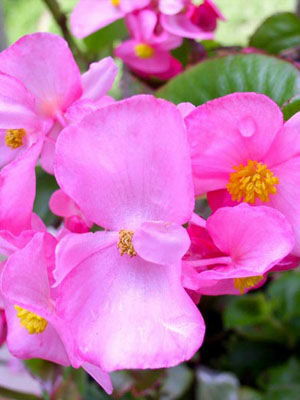 Most gardeners buy begonias as inexpensive bedding plants, set out in spring as soon as any danger of frost has passed. Large varieties like ‘Dragon Wing’ need wider spacing, or you can grow them in 35cm (14-inch) diameter containers. Because they are so adaptable, bedding begonias make excellent flowers to repeat in pockets throughout the landscape, which provides a sense of unity. Flower colours include pink, white, and red. Foliage colours can range from light green to dark red.